The car washes of Dhaid rarely embody the spirit of the exotic, but 7 km to the south east lies a beautifully green, quaintly rustic cricket field among plantations and gravel plains. It was an all-out, rural affair from the start with early, cunning home ground psychology at play. Dusk enveloped the setting with flood lights being held back to ensure the Darjeeling wagon train realised it was no longer in glitzy El Dorado. Given James’s recent confessional email about a goat in the desert we feared he may never leave the area. The captains toss, where adult men embrace their tribal responsibility and flick a piece of metal to decide who throws the ball at whom, was conducted in Dhaid’s muggy Autumn darkness by the light of a cellphone. It was our first loss of the night. The second would be Dexy, who after whistling down half an over of net-practice-like deliveries wounded himself and hobbled off the field to lie next to the boundary rope like a forlorn, beached Salmon. The floodlights fired to life and with the neatly choreographed exit-right by the pre-game entertainment of five startled, foraging hedgehogs, it was game time. The unique opening bowling combination of Man of the Match, Will Gregori Rasputin Watson (a 4-fer on debut) and the shuffling Badger immediately baffled the opposition. George would later compliment Badger on his unexpected agility-to-weight ratio, an athleticism which may have also confused the batsmen. As the loping left-arm mystic unleashed pacey, unplayable deliveries from within his ample beard, Badger looped in apparently terrifyingly slow turners. The batsmen capitulated to five down before long. The fielding effort was surprisingly suffocating given the Darjeeling reputation of generosity. Both Dorris and Scott held onto rippers, by our standards, and Ieuan proved a wicket keeping wall. However, there were notable efforts at big-hearted sportsmanship from an unnamed former international scrumhalf and then Ash, curiously, both using the white ball to demonstrate how a fat fledgling pigeon spills from a nest. A mixture of wides and ambitiously contrived overthrows were minor glitches supplementing the rare lusty blows that crept the opposition to 107. Dorris, apparently still marveling at his catch and contemplating more stomach-crunches in response to witnessing the power of his batting partner’s guns, nudged an early, gentle catch back to the bowler. George continued to slap deliveries around the ground and grumbled like a poked bear at the incessant yodeling of appealing fielders. The chorus reached its ambitious climax with a howl for LBW as a short, leg-side delivery was slapped for a boundary. George, tiring of the zoologists perpetual mistiming of strokes at the other end of the flat-rolled pitch, and pinching of strike, ran him out shortly before the composed, gentle downhill run with Laird to 107 for victory in the 12th over. George, desperately in need of protein-shakes after his flurry of wicket-to-wicket shuttle sprints avoided the post-expedition debrief at the Irish village. It would have been there he’d have heard the revelation by tribal elder and scorer, Nick, of a corrected mathematical glitch and the Hellyer maiden 50 not out. 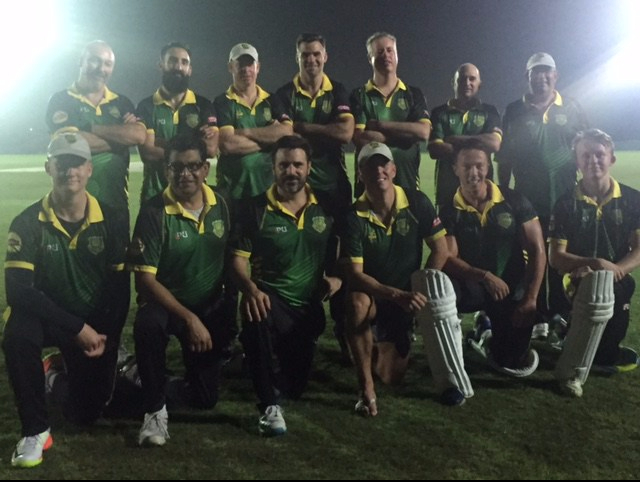 This entry was posted in Al Dhaid, Club News, Cricket, Match Report and tagged Al Dhaid Cricket Village, Cricket in Abu Dhabi, Cricket in Sharjah, Cricket in the Middle East, Cricket in the United Arab Emirates, Cricket Match, Friendly, News, Night, Social, Win. Bookmark the permalink.